In it's first impression ride, Overdrive found the new TVS Apache RTR 180 (code named the Menace), quite exciting and revolutionary. 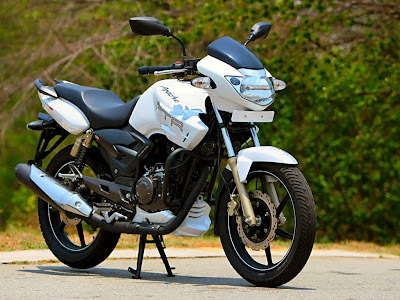 After reading through the containts, I think the bike's really revolutionary at least in one aspect, the aspect which has been very brutally and grossly neglected by every Indian manufacturers before..... the Power-to-Weight Ratio. For the new Apache RTR, TVS has opted for a lighter crank shaft, lighter magneto and bigger carburettor. The revolution that these small bits have brought is, the power has increased up to 17.3 PS, but the at the same time, the overall weight of the bike has remained more or less the same as the 160 version, making the bike more crispy and fun to ride. Also, it's mentioned that the RTR 180 has also increased piston strokes and that means it's a high revving machine. Again the swing arm has been extended by 30mm, so the flickability of the bike gets an added dose of confidence. So, going by it, I see the Bajaj Pulsar 180 UGIV already has some real tough competition ahead!! maybe the 2009 P180 UGIV is not meant to compete with the RTR 180 on the performance front..